Age, growth and maturity parameters are described for the Indo-Pacific squid Sepioteuthis lessoniana both temporally and spatially (equatorial, tropical and subtropical). Tropical squid that grew through periods of warming water temperatures grew 9% faster than squid that grew through periods of cool water temperatures. The tropical spring-hatched and equatorial squid had similar growth rates (3.24, 3.18 g/day) and these were significantly faster than the tropical summer/autumn hatched squid (2.89 g/day). The oldest squid aged was 224 days, but the majority of individuals were <200 days. Subtropical squid were larger, older and matured later than equatorial and tropical spring-hatched squid. 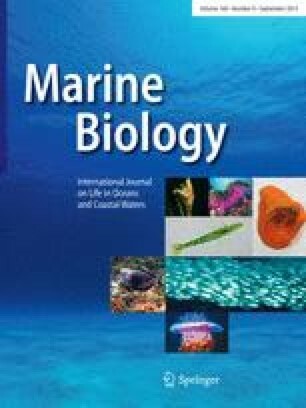 The mean weight of subtropical squid aged between 100 and 150 days was >400 g, 85% greater than tropical and equatorial squid. Geographical differences revealed that subtropical mature winter females and males had mean ages >150 days, respectively 17% and 23% older than their tropical mature winter counterparts. Temporal differences in age at maturity were also evident with tropical winter females and males having a mean age of ~140 days, respectively 41% and 25% older than their summer counterparts. Cooler subtropical and winter tropical squid had the heaviest gonads (>15 g ovaries, >1.5 g testes) compared to summer tropical and equatorial squid. However, relative gonad investment (GSI) values of the cooler squid were significantly lower with cool subtropical and winter tropical females having GSI values <3, which was about half the value of the warmer water females. This study revealed considerable plasticity in the size-at-age of this species. The tropical population had growth parameters that fluctuated between an equatorial strategy (fast growth, small body size, and small gonads) and a subtropical strategy (large body size, slower growth, and large gonads) depending on season.